Color Change Garnet is one of the most rare, interesting, and phenomenal of all gems. 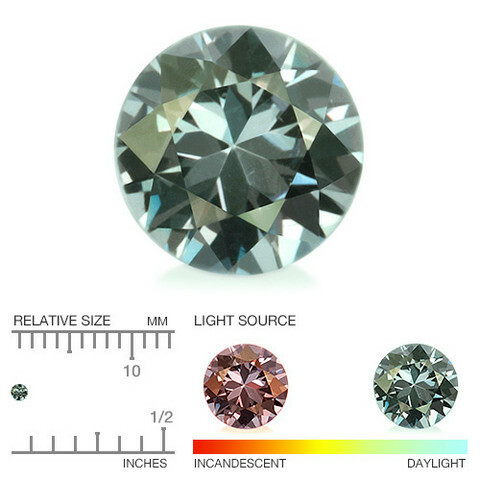 The color change can be intense and equal to the color change of top quality alexandrite. Color change garnets can easily be mistaken for alexandrite. Some of the best stones are from the deposit in Bekily, Southern Madagascar but top stones also occur near Chavia on the Kenya Tanzania border, as well as near Nandagala, Southern Tanzania. Stones from this mine are well known for their strong alexandrite like color change. To appreciate the full range of color change in these stones, one needs to observe the stones under early morning light, fluorescent light, late afternoon sunlight, and incandescent light. Color Key: Color changing from green or lavender to red. The color of the color change garnets is primarily a function of the time of day, the type of lighting, and the chemistry of the stone. Light is measured by color temperature. Cool daylight above 5500K will highlight the blue or the green colors while warm daylight around 3500K will make the stones appear red. Some stones will be almost blue at 5500K while others will not become blue until 6200K and, every stone from every mine is different. 5500K is considered to be in the neutral daylight range while 6200K is already considered to be fluorescent. Because early morning light is somewhat bluish in color and late afternoon light is reddish in quality, some color change garnets will be blue in the morning and red in the afternoon. Candle light is the ideal incandescent light and it was from candle lights that color change in gemstones was first observed. Our photographers use daylight 5500K and incandescent lights 3300K to highlight the color change. A typical color change garnet shot will maximize the observable color change by obstructing any unintentional ambient light so that the resulting image is a function of a singular unmixed light source. Early morning light will make the stones look greenish or bluish while afternoon light will make them appear red. Real natural daylight is impractical for photography because of its variability. Please see the chart below which illustrates the point.